A huge challenge on your entrepreneurial journey can be managing yourself, your time, and your stress. Maintaining balance to your work week is a great way to do all three things and gives you a structure that will allow your business to grow. While you can ignore elements of the below, eventually you will realize that not having all of these as a goal to be part of your weekly routine is going to hinder you, stress you out, and make you a grumpy business owner. Establishing a balanced work week is all about setting boundaries and prioritizing what you and your business need instead of always being reactive to crisis, clients or other external pressures. 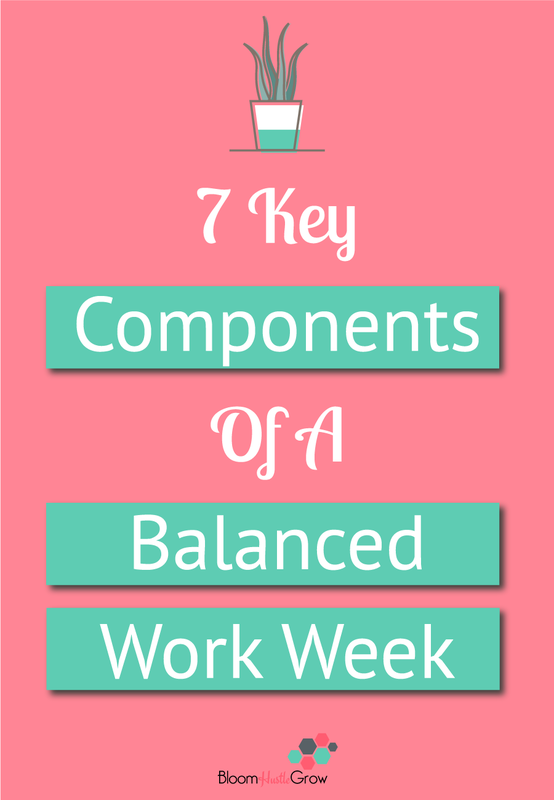 How balanced is your work week? So clearly customer service and client work should be a priority for your business, it’s your business core. BUT that doesn’t mean it needs to eclipse your whole week. You have to find a balance between working in your business and on your business. Serving vs. growing/maintaining. Having your work be ALL client work all the time can cause a major rollercoaster effects (feast and famine). Now you have to figure out what that balance is for you, but you can’t grow a business with 100% of your time on only client work. The best way to manage this is to have a strong client process, timelines, and boundaries. It’s critical to establish realistic deadline for your clients and communicate the process. If you don’t have clients, then it’s best to focus on the remaining 6 categories to get those clients in the door and keep yourself balanced! Part of running your business is attracting clients, it’s what drives your bottom line. Without some kind of marketing, you don’t have clients coming in. Of course, marketing can also include networking & content creating activities which I have included separately, but they all play into attracting clients. Many service-based businesses fall into feast and famine cycles mostly because they don’t always maintain a marketing strategy when they have an influx of clients. It’s essential to find a balance to what you can do in terms of maintaining a marketing strategy while still keeping up with client work. Not sure where to get started with a marketing strategy? Check out this post. Networking whether to gain clients or make biz friends, connecting with fellow entrepreneurs and potential clients should 100% be part of your week. Networking can be online or in-person and takes many shapes and forms. Having a group of business friends can be one of the best ways to get help, feedback, and encouragement. The entrepreneurial journey is never a solo one and you are making it harder if you are trying to go it alone. Need inspiration to start networking? Grab this list to get started! You should carve out some time in your week to create; either working on your content strategy if that is part of your marketing strategy and/or working on new projects that will advance your business. Projects can be anything that you need to work on to advance your business; it might be creating a course for passive income, implementing a new CRM system to streamline your processes, or working on your SEO. I’m a firm believer in personal development and lifelong learning. Whether that is investing in courses, reading, or taking webinars. Expanding your knowledge should always be part of your routine. Running and building a business takes a massive amount of inspiration and knowledge, so personal development is a must! You’ve got to be checking your email, making sure your finances are in order, invoices clients, updating your website, etc. It’s important not to let your day-to-day operations get away from you. Having a solid weekly routine to address administrative duties prevents a mess that only gets harder and harder to clean-up the more you let it pile up. I’ve said it before, but it’s worth repeating. You must find balance to your business schedule so that you are taking care of you and aren’t on a train to burn-out ville. Personal is whatever you need to be the best you! It might be walking outside, gym time, morning meditations, or afternoon coffee breaks. It’s not skipping meals, sustaining only on coffee and being chained to your desk. Read more about finding balance in this blog post. So how balanced is your week? Do you have a good flow and routine? And I use week a bit loosely like most routines you should have a goal or ideal, but know that every week, of course, will not allow a perfect balance. Balancing your week is about finding what you need to work best while minimizing stress and maximizing effectiveness.